Waukegan offers bicyclists access to the northern branch of the North Shore Bike path, which extends all the way into Wisconsin if riders choose to follow it to the end and this makes Waukegan an attractive destination for cyclists in neighboring cities as well as Waukegan residents. The increasing popularity of cycling comes with an increased risk that bicyclists will be injured when involved in accidents with the motorists they are required to share the roads with. The Waukegan bicycle accident lawyers at Rosenfeld Injury Lawyers LLC are prepared to represent the interests of anyone who has been harmed because others failed to take proper precautions to avoid an accident. Many of the bicyclists who travel through Waukegan are brought to the city via the North Shore Bike path, but fatigued bicyclists may wish to take time to rest or alter course to gain access to restaurants or attractions within the city. Those who ride bicycles within Waukegan’s city limits are considered to possess the same rights to city streets that motorists do (Waukegan Municipal Code Sec. 21-12) and have the same duty to follow the rules of the road. Therefore, it is important to understand your own responsibilities when using city streets in order to avoid liability in the event that you are involved in an accident. 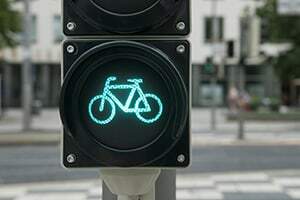 For the most part, Waukegan has differed to Illinois state law in the treatment of bicyclists, which means that bicyclists are to be treated as if they were vehicles on the road and must follow all traffic control devices. You must signal your intentions to alert drivers to your position on the road and desire to make a turn. If riding at night, your bike must be equipped with a headlight and reflectors on the pedals and back of the bike so that drivers can see you. Vehicles are now equipped with advanced technologies that shield occupants from many of the dangers that result from accidents, but bicyclists are out in the open and subject to experience far more serious injuries. The severity of bicycle accident injuries is highly dependent on factors such as speed upon impact, whether the bicyclist was thrown from the bike or caught between the vehicle and another object and the type of safety equipment being used. If an accident results in any of the following injuries, the required medical treatment can become extensive and costly. Traumatic brain injuries that result in neurological conditions requiring long-term treatment. Compound fractures requiring surgical repair. Lacerations and abrasions caused by contact with glass, metal or the pavement. Injuries to the neck, spine and back which may cause paralysis or require a prolonged regimen of rehabilitation before the victim can regain his or her previous physical abilities. If you have been injured in a Waukegan bicycle accident, the first steps that you take following the incident will dictate your ability to determine fault and to seek compensation for the treatment of your injuries. The very first thing you must do is seek medical attention, even if you feel fine. Trauma to the head can result in injuries that do not show symptoms for weeks following the trauma, and when these injuries remain undetected and untreated for so long, they become more severe. Next, you want to preserve as much evidence from the scene of the accident as possible. Finally, you should consult with a Waukegan bicycle accident lawyer to review your case and consider whether you have legal grounds to file a lawsuit. Rosenfeld Injury Lawyers LLC has secured compensation for thousands of bicycle injury victims across the greater Chicago area and would be happy to review your case with you at no risk or obligation. We will fight hard to ensure that you receive the maximum damages available to you and if we cannot secure compensation on your behalf, our services will be free.